Over the past few months I have been readying myself for the supposed entry into maturity that is turning 30. Like most of my friends who have already moved out of the 20’s, I have had a few minor spin outs, but have in general approached the impeding milestone with ambivalence. The big day came just over a week ago. I was firstly spoilt by H with amazing presents that she had arranged. 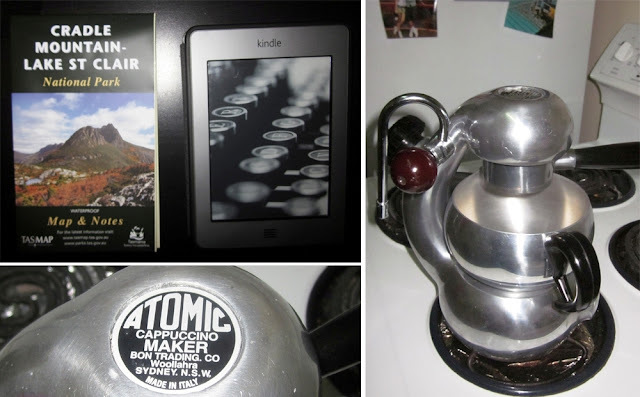 An Atomic Coffee Maker courtesy of her family in the UK, a Kindle from friends in Sydney and flights booked to Tasmania to do the Overland Track! We are booked in for late September, outside the official season and still quite wintery, just how I like it. For Holly to book such a trip is amazing considering her love of warm beach type holidays. I was and am stoked with these incredibly thoughtful pressies. Arriving at work, I was greeted with 20-30cm of fresh powder, thankyou snow gods! After getting amongst it in the morning it was time for that fabulous office tradition, cake. Our very own resident pâtissière Carmen, although not at work at the moment, had made me a delicious chocolate cake and 30 mini cheese cakes. On Friday afternoon, we took the well worn road up to Sydney to celebrate with friends and family. We had the most delicious dinner at Jamie’s Italian in the CBD. The antipasti plate was incredible with the best prosciutto I have ever eaten. Most of us went for the fresh pasta options for our mains, I had the chilli prawn linguine. Troy, my sister’s boyfriend, took on the 650g t-bone steak for two, by himself! It was a great night and we left with full bellies and warm hearts. The fun continued the following morning when Holly and I went to my cousins café at Bronte for breakfast with my Aunt and some of la famiglia who are always in the café getting their coffee fix. As usual the breakfast and coffee were outstanding. From Bronte, we went north to Manly to pick up my final present, a handcrafted surfboard made by Neal Purchase Jr. Neal makes the most incredible stub quads, single fins and other planing boards. Holly, a bunch of friends and my family had organised a beautiful blue stub quad for me. Massive thanks to the fellas at The Shop Next Door for pulling all the stops to get my new board to Sydney on time, cheers! I was keen to surf my new board but I would have to wait a couple days as it had only recently been glassed. We spent that night partying with new friends and old in the city. It was so great to catch up with so many of my friends and see everyone having a good time. I took bugger all photos, which is a shame but here a couple. I woke slightly hungover to a full house on Sunday. Mum and Dad had arranged for more friends to come round for breakfast. Again, it was great to catch up with everyone. By this time I was well in need of a salt water cleansing. 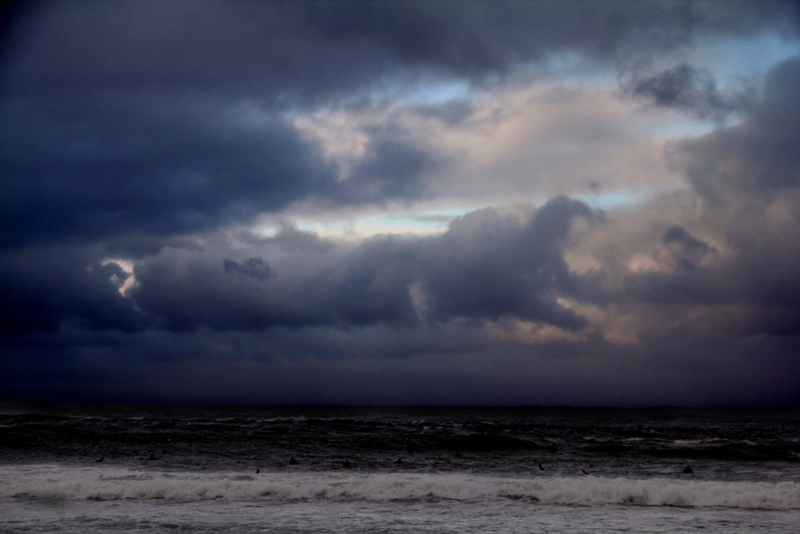 Unfortunately, although there was plenty of swell, a raging southerly was creating wild conditions for surfing. However, I did have one secluded and rarely surfed left hander in mind. I grabbed my Dad’s beautiful Mark Rabbidge 8’1 and hit it. I got a couple of nice windy lefts, clearing the cobwebs. We had a quiet night at home on Sunday and prepared for the drive back to the mountains. Although the weather had cleared and was an unseasonal 26 degrees, the surf was still wild and out of control on Monday morning. I was keen to use my new board but it wasn’t looking good. 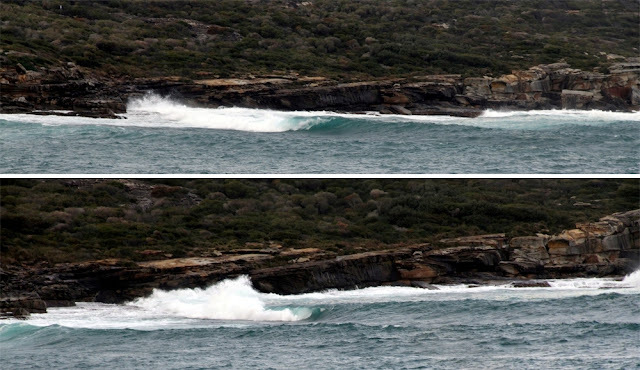 I had an inkling that a fickle reef at Coogee may be breaking. We checked it and there was the odd wave coming through. My board probably hadn’t fully cured but it was time to get it wet. Although the surf was pretty crappy and I only got a few waves, the board went unreal. I can’t wait to get it back in the water. It was finally time to hit the road back to the mountains. Thanks to everyone who eased my transition from a surfing and skiing bum of my 20’s into a minimally mature 30 something. Special thanks to Holly for making it all come together. I’m stoked to have such amazing and thoughtful friends and family and am looking forward to all the adventures that the 30’s offer, yew! Not all adventures go as planned. Although I would always hope to score nice weather and knee deep powder, crappy Australian conditions and busy schedules mean sometimes you have to take what you can get. 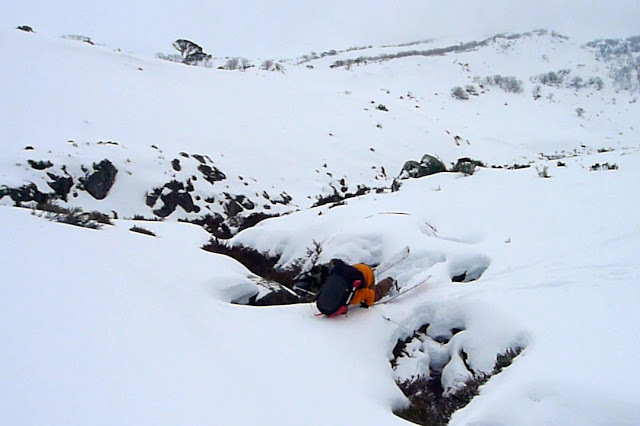 I have been planning an overnight backcountry skiing trip with my mate Matty for the past couple of weeks. 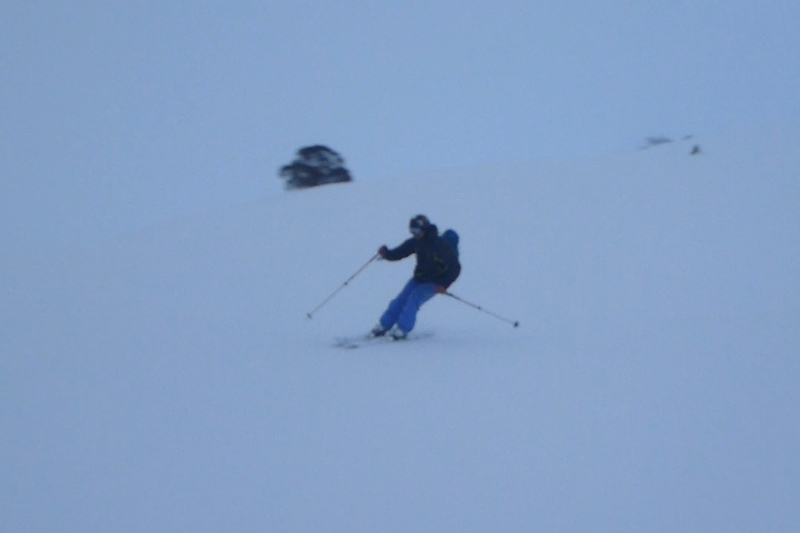 The plan for Day 1 was to head out from Guthega early, find a good campsite then spend the day riding powder. Day 2 we planned to ski until lunch, decamp then make it back to Jindabyne in time to have dinner and a beer with smug, freshly goggle tanned, faces. Well that was the plan, in reality, our trip was quite different. It was all due to the weather, horrible blizzard conditions were predicted. This had an impact on our gear choices. I had planned to bring two small 1 person tents and then cook and eat outside. There was no way that we could do this looking at the forecast. What to do? How about bringing my heavy car camping tent which has a huge vestibule. It’s a big heavy Vango number, a great tent but not quite designed for light ski touring. We split it and stripped it and still ended up with 3kg of tent each. Despite the weather and heavy packs we made a good start out of town on the road to Guthega. A fresh dusting held some promise. Exciting or an ominous sign of poor weather? We made some turns down to Farm Creek to get the legs going. The snow was pretty good. Matty however, not used to riding with a heavy pack was struggling. He had a couple of falls until he got the hang of the extra load. We made our way out to the Illawong swing bridge which spans the Snowy River. We took some turns where we could. 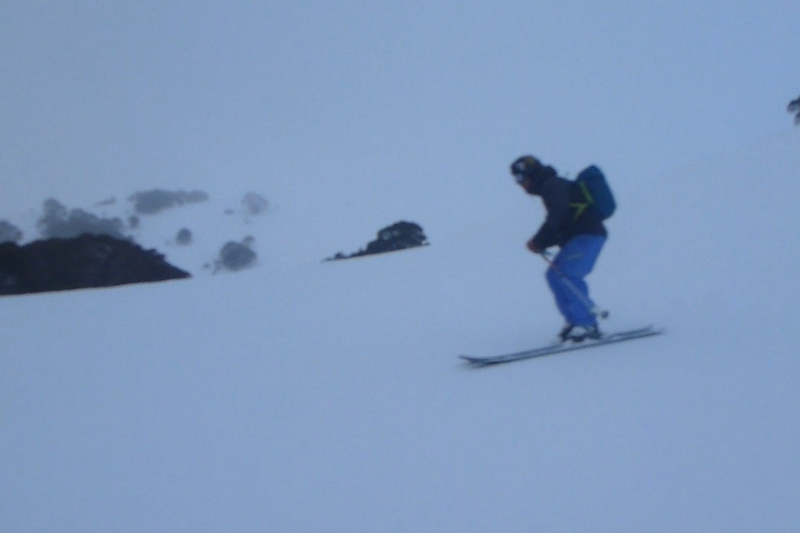 Matty, being new to split boarding (and riding on two planks) had some interesting moments on the down slopes. Two stacks in particular were hilarious (from my point of view anyway). A slow, back lean snow plough and a face plant on a narrow snow bridge. Despite these trials and tribulations we made it to Illawong in pretty good time. The weather, although overcast was holding up ok and we were pretty excited to get over the bridge, set up camp and then hit the slopes. 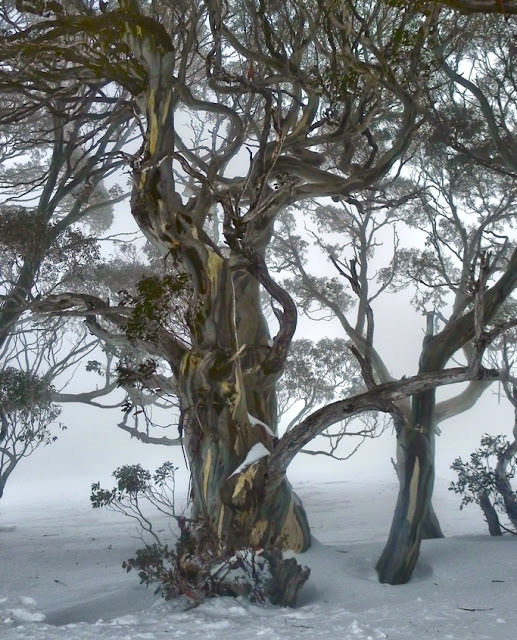 We found a nice spot amongst some snow gums and set up camp. We had a quick lunch then hit the slopes. Using only our small day packs, Matty’s skills were improving fast. We made a good climb up to a ridge off Twynam Creek. Dropping in the light was really flat and we struggled a bit as we made our way down to the Snowy River. At the Snowy the clouds lifted a little to give us the smallest glimpse of a sunset. We refilled our water at Twynam Creek and then skinned back to camp. We pulled out the down jackets, cracked the Port and settled in for the night. Dinner for me was wild mushroom risotto while Matty went for a venison stir fry, both rehydrated and recommended by John at the Mountain Adventure Centre. The Port, coupled with chocolate did its trick and we were in our sleeping bags by 9. The weather when we retired was overcast and snowy but not too bad. At around midnight, it all changed. I was woken by sago (frozen rain) being smashed into the side of the tent. The wind had picked up dramatically, it felt as though tent was about to take off. I was sure that a pole would brake or some other catastrophic failure would occur. I spent the rest of the night trying to sleep while the Snowy Mountains battered us. As soon at it was light, we got up and started packing, the weather was shocking and the warmth of civilisation was calling us. To its credit the Vango tent held up to everything that was flung at it that night and the massive front vestibule proved to be essential. 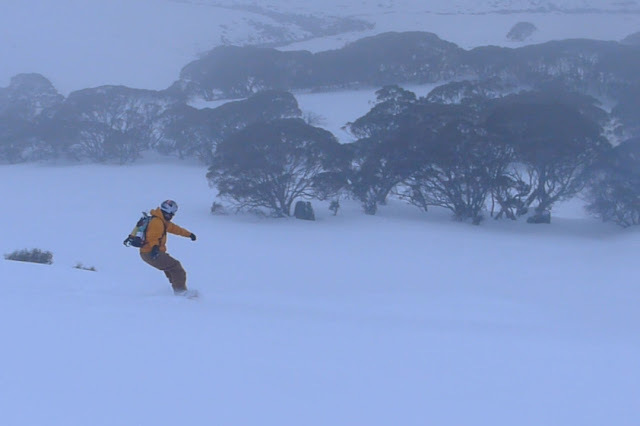 We skied back to the Illawong bridge, crossed over, and continued on our way back to Guthega. Instead of contouring back around to Guthega we skinned up to the ridge (northern end of the Paralyser perhaps?) to salvage some turns for the day. 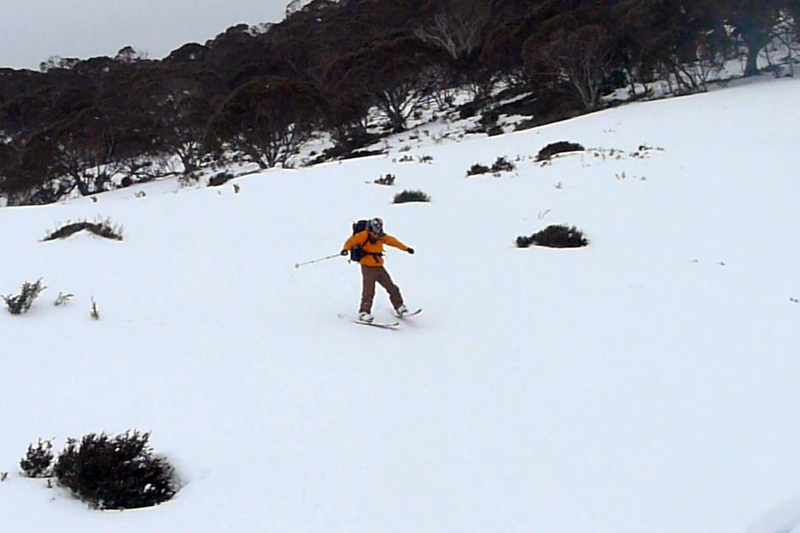 We transitioned and skied about 100m vertical down to the Farm Ck bridge, stoked for at least some turns. From Farm Ck it was a quick walk back through the village. We drove around to Perisher and ate a delicious pizza at Aldo’s with the masses who were opting out of the nasty conditions on the hill, if only they had an inkling of what it was like beyond the boundaries! 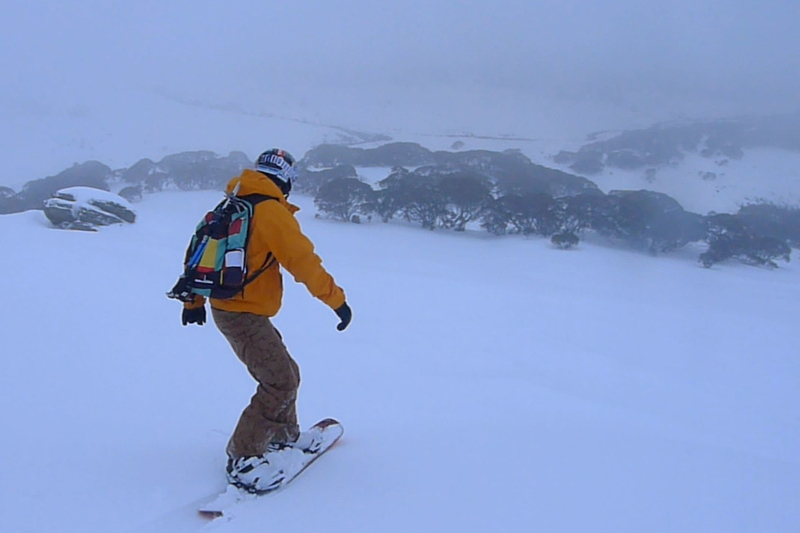 Matty was stoked with his Venture split from First Light Snowboards and Wilderness Sports. Hopefully our next outing can coincide with sunny days and knee deep powder.